We received the scores to Robert Beaser’s Chaconne a few days after we (Boston Guitar Orchestra) performed Mussorgsky’s “Pictures at an Exhibition” before Zoran Dukic’s concert on 10th February 2018. By then, we had heard rumours that the Chaconne was a difficult piece. Some of us begged for reduced parts, e.g. 3a, 3b, etc. However, even the reduced part looked daunting — and I decided that daily practice was in order. At our first rehearsal on 26th February, our conductor Robert Bekkers led us through the entire piece, section by section. That’s the beauty of being in an ensemble: you study your own part but you don’t know how it sounds until you play with others. It took all three hours of the evening to get through this nine-movement piece. Tempos were deliberately slow. As we left the third floor of the New England Conservatory (NEC) where we usually rehearse, I had a sense of “we can do it.” This was the first stage: feasibility. The conductor probably wanted to give us a feeling of confidence — that it was doable and worth striving for. At the second rehearsal on 5th March, we were told that we’d start half-an-hour later than usual and that several NEC guitar students would join us. Their teacher, Jérôme Mouffe, director of Boston Classical Guitar Society, conducted that evening. For the first time, we heard how the piece was supposed to sound. Sure, we had mp3 versions of the Sibelius file but nothing compares to hearing it played live. Apparently Jerome’s students had been given the scores earlier than we as it was obvious from the beautiful sixteenth runs they executed. I felt a lot more confident sitting next to someone who had studied the piece thoroughly. Each of the four guitar parts now had a de facto section leader. Having finally heard the piece for the first time, I couldn’t wait to study and improve my part. The beginning was beautiful, like a sigh entering into something ethereal. I wanted to hear it again. I also loved another passage, Piu animando: intimo, intimate and animated, which I wanted to hear over and over again because guitar 3 (my part) comes in like a gentle welcome. We added an extra rehearsal in the Walter Baker Artist Lofts common room on Sunday 11th March. What a difference it was, without the NEC students! I looked forward to the next rehearsal the next evening (12th March) with them again. This time Robert Bekkers focussed on the challenging areas, where tempos and time signatures changed, particularly the transitions between movements. We were told that other guitarists would be joining us for the two-day ensemble weekend near Harvard Square. Although we didn’t know who or how many they were, we were confident that the more could only be the merrier, for more guitarists always produced a fuller sound. On Saturday 17th March at 9 am, we registered for the festival at Longy School of Music and joined the other guitarists on stage for a technique warm-up. Immediately afterwards, Robert Bekkers led us through the entire piece. Guitar one was overpopulated, at a ratio of two to one (in other parts). They were also the most competent. I couldn’t fathom if it was the children from the music school in New Jersey or the NEC students. Suddenly I felt ill-prepared. How could the guitarists playing the most challenging passages play so well? We split into four groups for the four sectional rehearsals. Will Riley, who had led us through the warm-up session and teaches at Longy, led us through the piece, starting at the end. I enjoyed the last section “Clave!” when I felt like dancing. I was glad we finally split into sections so that we could actually hear and understand what we were supposed to do. I was also relieved that Jim from NEC had mastered the fast runs, for I’d rather abdicate than attempt moving up the neck in new positions. Later I learned that it was possible to just play the first note of every four to keep up. Had I known this earlier, I would have practised the simplified version. Instead, I found myself gleaning over the fast passages hoping that I’d re-enter the more do-able slow sections at the right time. 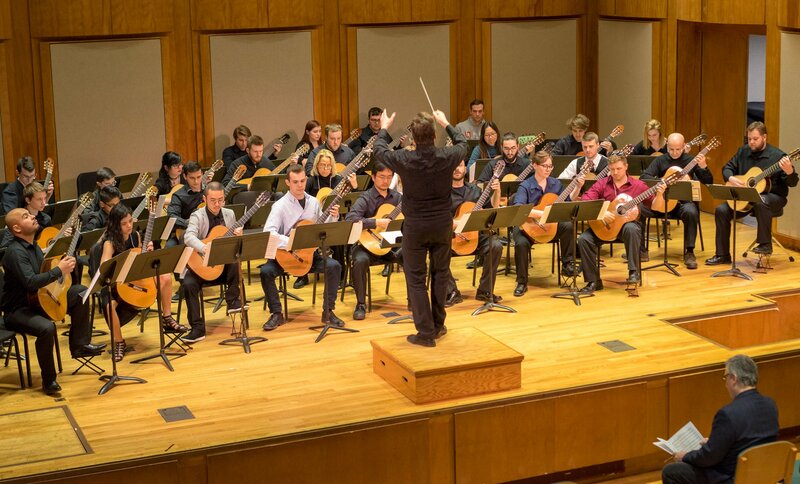 The combined orchestra was made up of guitarists from Berklee College of Music, Boston Guitar Orchestra, Liberty University, Lindeblad School of Music, New England Conservatory of Music, and Rhode Island College. They travelled as far south as Virginia. Could the festival orchestra get any bigger than 32? There were about 12 in guitar one, and six or seven in each of the other parts. Had we been more evenly distributed, would it have sounded differently? The next day, Sunday 18th March, the composer arrived at the morning rehearsal. He wanted us to play to the tempo specified. Surely he’d rather get quality than quantity, I thought. My only fear at that point was to be called to play a particular passage by myself, or that our section would be asked to play alone and people would look at us. No, I was going to hide somewhere in the back so nobody could tell whether I was part three or four. Luckily the electric bass player directly behind me kept me in sync. With the conductor in front and the bass player behind me, I thought I stood a chance at playing my reduced score. It was obvious that the parts were not evenly distributed — we needed to hear more of part two and four. After the morning rehearsal, the conductor changed the seating arrangements so that part one guitarists didn’t take up the entire front row. All the hours of practising and the multiple times we met for group rehearsals vanished as we got together for the premiere at 4 o’clock. Longy’s Pickman Concert Hall was filled with people that weren’t there for the two days of rehearsals. Had they come just for the premiere? We were the “warm up band” for Eliot Fisk‘s solo concert and what a privilege it was to give the world premiere to Robert Beaser’s new work and play it before Eliot Fisk’s concert. Days later, I still can’t get fragments of the Chaconne out of my mind. It’s an ear worm that has dug into my very being. The only way out is to play it again.